Guys, I'm joining the hype. 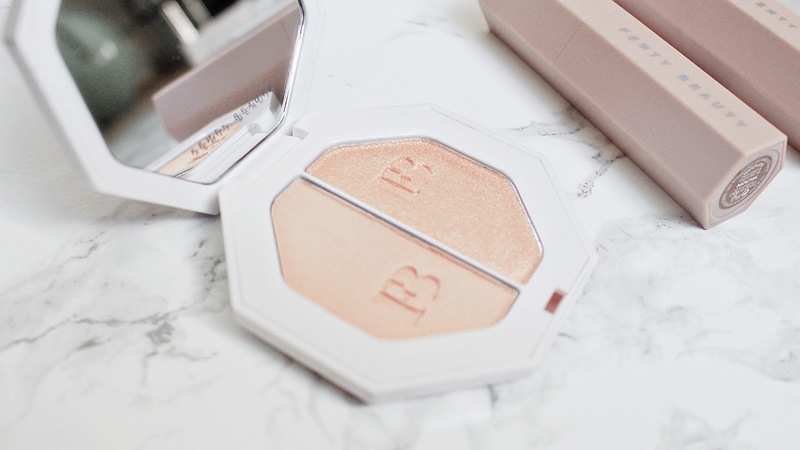 Fenty Beauty is here and it did not disappoint! When I heard Rihanna was launching a beauty line, I was one of the few who wasn't initially going insane. I like Rihanna, but I'm not a die hard fan, and as with all celebrity beauty lines...I was skeptical. BUT...I'm prepared to hold my hands up and admit I completely pre judged and I was SO wrong! Whilst in Harvey Nichols, I picked up a few bits from the collection and I won't lie, when I saw the counter, I was HYPED. I left with a foundation, 3 Match Stix and a Killawatt highlighter duo. I've had a good old play and been wearing the products every day for the past week. Here are my thoughts. Anyone who knows me will know I am NOT a matte foundation gal. I am all about that dewy glow - and even with a slightly oiler completion I like my skin to look wet! So when I saw that the only foundation option was matte, I panicked. BUT, I must say, if I was ever going to fall in love with a matte foundation, this would be it. Although it's matte, it isn't overly thick, or drying, and still leaves my skin with a nice glow. The finish is gorgeous (I'd say it's more of a satin finish than truly matte)- not powdery or cakey and the coverage is fantastic - medium but could definitely be built up to full. I'd say I got about 8 hours of wear before I felt like I had to touch up, but it wore well throughout the day without going patchy or crumbly. Although this will be a great everyday foundation for some - I think this will be saved as a night out foundation for me, purely because of the thicker consistency and matte finish. Overall, this product gets a massive thumbs up! Designed to contour and highlight the face, these little gems are such a DREAM. On appearance, the sticks look hard and dry, but I was so surprised at how creamy and blendable they were on the skin. I'd go as far as saying this is the best cream contour product I've used. The wide range of shades is also ideal. With contour, there is such a fine line between too ashy and too muddy - finding the perfect shade is hard, but with 20 different shades, RiRi makes it easy! I am so impressed with how intense and long lasting both the contour and highlight sticks are, once set with a powder/bronzer, these didn't budge from my face ALL DAY. I apply the contour shade with the portable highlight brush (also from Fenty Beauty), and blend the highlight shade under my eyes and cheekbones with a beauty blender - dream combo! If your a newbie to contour and highlight, I honestly think these products are a great starting point. Highlight of dreeeaams! This duo is absolutely stunning. Both of the powders are finely milled, so no chunky glitters or sparkles. The duo I picked out has a warmer tone, because personally I don't like a chalky/ashy highlight - I prefer something still striking but with a more natural finish. Hustla Baby is the more intense colour of the two, definitely a bold HI LOOK AT MY CHEEKBONES THEY'RE GLOWING type of look, where as Mean Money is a lot more subtle, almost like a soft sheen on the skin. If I'm being honest, I reach for Hustla Baby much more than Mean Money, but I love that the duo caters for both those who love a bold highlight AND those who prefer a more natural finish for everyday. 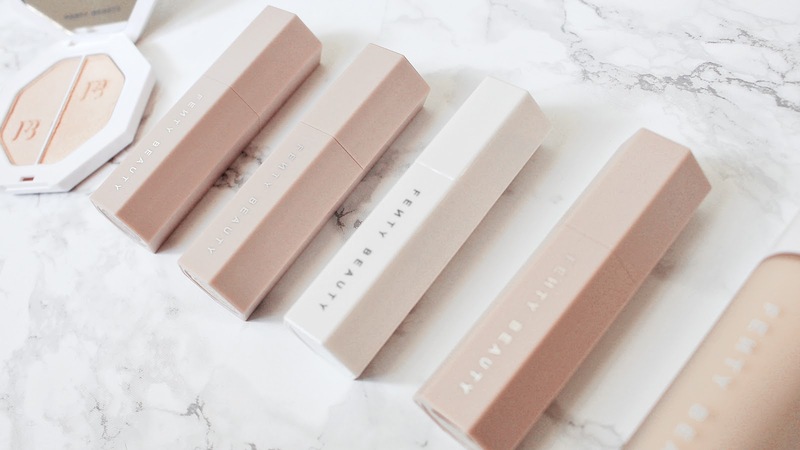 Like the Match Stix, the formula of the highlighter duo is extremely long wearing (after a full day of wandering Edinburgh AND a 30 minute intense workout, this stuff was still on my cheekbones...sorcery!) I definitely want to try out more colours from the range. Okay, those are my thoughts. 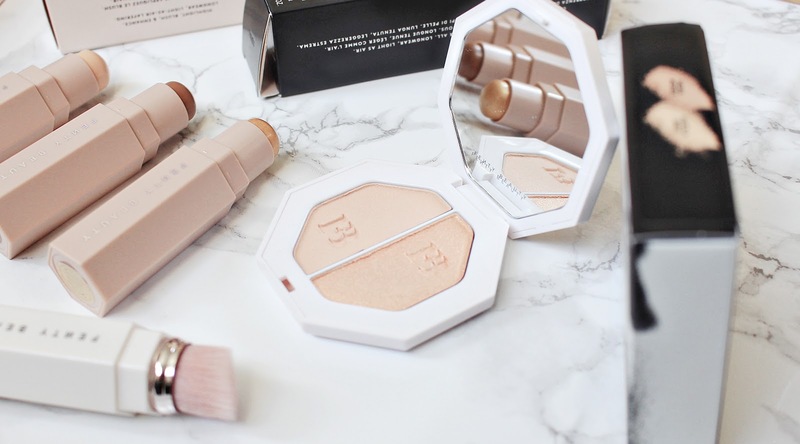 Have any of you tried Fenty Beauty? What do you think? Are there any products I haven't mentioned that you think are real stand out products? Let me know.